Regarding the trailer, get the proper towing accessories to go along with the trailer. The last thing you want is to hook up a trailer only to find it lying on the highway a few miles from your truck, only because it came loose and you didn’t even know it. If you are unsure how to hook up a trailer, ask someone at the trailer dealership or place where you rented your trailer. They will show you how to do it. Other factors you will need to consider when figuring out the right delivery method include the following:1. Budget: You will need to go over your budget to make sure it fits your business needs. What if you do not have enough to sustain your business for a long period? In that case, you may have to borrow the money. You will need money to pay for the equipment, whether you are renting or buying. 2. Schedule: Look at your schedule. Are you running your business part time? If so, do you have enough time on your schedule to devote to the event? Do you have enough time to make appropriate contacts for the event? 3. Risk Assessment: You will need to consider cases of failure. What if one of your inflatables was to fail in some way. Do you have any backup inflatables? Can you get in touch with the supplier and have a replacement sent ASAP? You will need to know how much risk you are willing to take. If you can go far, you may be alright. What if you get the inflatables to the location and find that you ordered the wrong products. Can you swap them out quickly? If not, the client may decide to cancel your services. Can you handle that situation? Will the supplier allow you to return those items before your scheduled time, and will the supplier give you credit for the time remaining. 4. Your expertise: Just how much do you know about inflatables or the entertainment industry? Are you starting this company just to make money, or have you thoroughly researched it and have some kind of background in running a business. 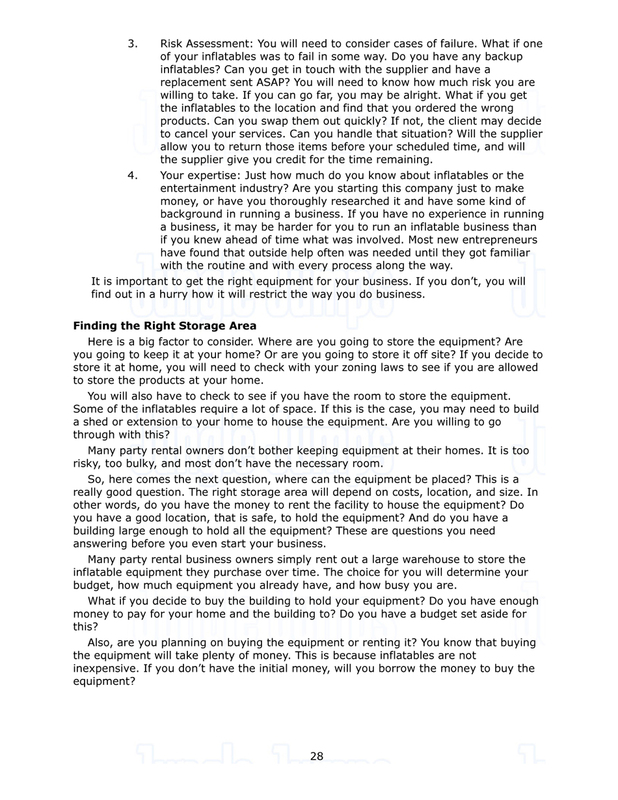 If you have no experience in running a business, it may be harder for you to run an inflatable business than if you knew ahead of time what was involved. Most new entrepreneurs have found that outside help often was needed until they got familiar with the routine and with every process along the way. It is important to get the right equipment for your business. If you don’t, you will find out in a hurry how it will restrict the way you do business.Finding the Right Storage AreaHere is a big factor to consider. Where are you going to store the equipment? Are you going to keep it at your home? Or are you going to store it off site? If you decide to store it at home, you will need to check with your zoning laws to see if you are allowed to store the products at your home. You will also have to check to see if you have the room to store the equipment. Some of the inflatables require a lot of space. If this is the case, you may need to build a shed or extension to your home to house the equipment. Are you willing to go through with this? Many party rental owners don’t bother keeping equipment at their homes. It is too risky, too bulky, and most don’t have the necessary room.